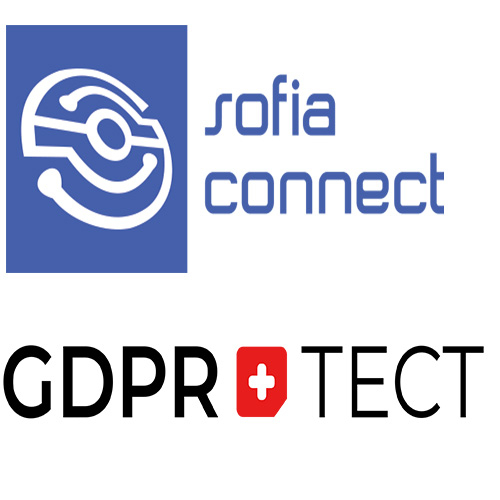 In accordance with the signed agreement, GDPRTest will evaluate Sofia Connect’s level of congruence with the GDPR regulation on one side and on other, Sofia Connect becomes an official partner of GDPR Test, which will allow all partners and customers of Sofia Connect to purchase GDPR Test Products on a special price. “The reliance that Sofia Connect is giving us is a proof for a job well done! We created a product, that saves time, resources and expenses but most importantly our product answers the important question, that every business is asking now – Do we comply with GDPR regulation? Being recognized as a partner by a company as Sofia Connect is a true recognition and a huge compliment for me and my team! GDPRTest is an artificial intelligence system built by a team of Bulgaria's leading experts in areas such as management, business administration, finance and accounting, sales, law, compliance, IT, cyber security, Internet applications, design, and others. The large combined experience of the team, standing at over 200 years, is a guarantee for the quality and effectiveness of the product of the GDPRTest system. GDPRTest is developed as a disruptive technology which delivers value in the form of innovative solutions only made possible by artificial intelligence. During the development process, the team was focused to bring businesses in Bulgaria a new and effective way to easily tackle and solve the challenges and problems which are involved in reaching GDPR compliance. Sofia Connect provides high quality and reliable services to telecom operators, cloud service providers, data centers and business customers. Company presence in Europe, North America, the Caucasus region and the Middle East makes it a preferred partner for companies who want a fast and efficient expansion of the service portfolio. Sofia Connect treats their partners and customers individually, analyzing each detail regarding their routine activities, business strategies and sales expansion plans while keeping focused on the effective relationships beneficial for all parties.